24 July :For the fifth time, Army’s ‘Dare Devil’ motorcycle display team has found a place in the prestigious Guiness Book of World Records. 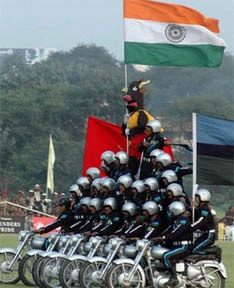 Known for its stunning feats, the team from the Army’s Signal Corps made it to the record book on 11th June this year when it successfully displayed its skill to carry 251 men on 11 motorcycles for a record-breaking distance of 240 metres.Army chief General Deepak Kapoor felicitated the achievers at a function in South Block in New Delhi. ‘Dare Devil’ captain assured Gen Kapoor that the team would soon be attempting an improvement on its own world record. The ‘Dare Devils’ already have four world records to their credit since 1991 and all have been endorsed by the Guiness Book of World Records authorities. The first World Record was made at Gwalior in 1991 when 40 team members rode seven motorcycles to cover a distance of 400 metres.Next came its world record in Pune in 1993, when the 81 team members on nine motorcycles rode for 200 metres. On the third occasion, again at Pune in 1996, the team’s 140 men were on 11 motorcycles and they covered 100 metres.Their fourth world record was made at Jabalpur in 2001 with 201 men on 10 motorcycles covering a distance of 100 metres.